Honestly, a copy of Call of Duty: Game of the Year Edition had actually been sitting around un-played in my home and I just decided to give it a whirl. I am not sure how long it was in my possession before I rescued it from the bottom layer of past plundered videogame booty. Knowing my buying habits, it was probably picked up for no more than 3 dollars on some thrift store excursion. This article comes after completing the main campaign on the hardened difficulty. A major problem that this Call of Duty has is overall cheapness. The player is bound to die many ways from unpredictable and unpreventable sources. I find that it is best in games to leave the deaths and failures due to a lack of skill or unfamiliarity, not unfairness. Call of Duty disagrees. Like any game worth its salt, Call of Duty is programmed not to spawn enemies in front of you. This is good, as it should prevent the player's removal from emersion into the laws of the gaming world. Since this game portrays World War II as it happened, this means a basis of realism, so much that it doesn't step over good gameplay. The implementation of enemies appearing though is garbage. The game spawns enemies behind the player and in sectors previously cleared. I'm not talking about purposeful spawning, such as during backtracking in a level, and finding new enemies awaiting. This is about unexpected spawning to even a knowledgeable player on the level. 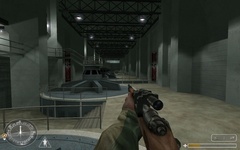 As a showing of this point, on a boat level, the worst offender, the player could climb a set of stairs and if staring at the next doorway, there would be no enemy present. Stop and rewind. (Or use a save) Walking up that same set of stairs but this time turning to face the wall before the door, would result in the player coming face-to-face with an enemy punching his eyes out. Also bad is clearing out an area, trying to move forward, but now being shot in the back. How did they appear so silently and quickly? It appears that most of this ninja spawning occurs on non-linear areas. For better or worse, most of the levels are linear meaning this occurrence is contained to the few open-spaced levels, Dam, Boat Etc. Could not a better implementation have been done? Other cheap deaths occur because the AI is incredibly good at picking out your head as you learn out for a quick view. Granted, this may have been factored in because of my playing difficulty, but that doesn't curb the frustration when an enemy solider "activates" and rushes out from behind cover machine gunning the player to death because their reaction time is devastatingly quick. There is no way that they knew I was there! Since the game has many hallways, you have to take EVERY hallway with a quick glance around the corner, or a pre-emptive grenade, to avoid damage. What else is le cheap? Call of Duty is not a heavily scripted as the other games in the series, but the instances it is are extremely obvious. The worst of the scripting were the on-rails missions. While being ridden around, you are supposed to shoot at the enemy vehicles/infantry and stop them from busting your ride. The drive-by shooting is fine. Call of Duty's methodology for damage distribution is the bothersome portion. Sections of the driving missions can be played without a single shot, and the player will not take any damage. The enemy bullets will plink harmlessly off the vehicle or whiz overhead. On other parts of that same mission, the enemies will snipe the player with deathly precision and magnitude. Whole health bars can be reduced to slivers in seconds. The player can be crouched down hidden from viw, and the enemies show no variation in their striking. The damage dealt during these "damaging" segments do scale up with the quantity of enemies left standing, yet it is far too difficult to kill every enemy while moving at high speeds past them. On hardened the player must be extremely selective of the targets, waiting for the enemies to disappear in a "passive" moment so you have the full clip of ammo to remove enemies in a "damaging" moment. Having to predict these moments, even dying multiple instances to be forced to play the moment again and again to learn them, is not entertaining, especially since it feels out of the player's control. Instead of epic escapes, these moments were tedious memorization shooting galleries. Lastly, irking me a lot while completing objectives, the enemies show no remorse. It is as though the level-designers and the AI programmers didn't sort out their objectives. What do I mean? Well, there are a couple occasions where player must sit on a stationary gun emplacement and kill objective targets, usually tanks and planes. Now, these guns are slow, and are meant for their specific targets. I can attempt to kill infantry, but this is very inefficient and I will be overwhelmed quickly by their numbers. Now, I can try to clear out the infantry, before attacking the objectives but this is usually limited by two things. Either A) The enemies infinitely respawn, or B) there is a time shortage. This makes dispensing all the infantry unfeasible. With all these factors in mind, why couldn't the player have been granted some "passive" enemy shots that plink harmlessly? I ask because I died trying to do what the game was telling me to do. The parts are not impossible, as I passed them, but the level of annoyance to pass them far exceeds the reasons for playing them. Thanks to the increasing maturation of gaming, all of the points made up to now have been addressed in more recent offerings from Call of Duty, as well as general gaming. Call of Duty is both blessed and cursed with a long draw distance. This allows for seeing the MG42 firing on the advancing German forces, or the fallschirmjagers protecting a mansion in the evening. This same draw distance affirms the plainness of the levels. Absorb the wide-open landscape of barrenness. The remote tundra of blocks, and the fine blocky architectural marvel of Europe. The Quake III engine was never that great at doing environments. Walls and floors are made primarily out of blocks or curved splines, with some diagonals cut out for flexibility. Such fundamentals result in levels that are noticeably blocky, and so Call of Duty has blocky environments. 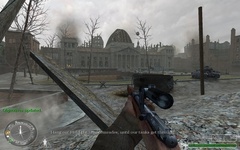 To alleviate this visible shortcoming, the Call of Duty developers have added many texture details such as pictures, boxes and rubble, which help to liven up the landscapes. Less blocky models imported into the engine such as trees, characters and ergonomic objects further even out the scene. Some indoor settings will look almost up-to-date graphically, a compliment to the capabilities of the game/developer for the gaming generation. There were times when I also stopped to enjoy the fine texture-work, such as the cobblestones of a building, or a fallen German's paper, of which I could make out the portrait. Sadly, I try to do the same the Rage demo for the PS3 and I find a blurry mess. Are graphics really improving over time? the Rage demo's blurriness could be viewed from quite a distance away, but in Call of Duty I usually had to plug my nose against a surface to see the blur at a resolution of 1680x1050. Character models were another highlight in the graphics sector. Friend and doe alike would blink and visible breath in and out as they awaited their next motion. They would also react to shots fired by flinching, recovering, and returning fire in smooth motions, having enough animations to keep the enemies interesting. Now some of these animations are a little awkward. I still can't accept the running while couched animation to be natural. It looks like they are hobbling to their destination without functioning knees. Animations also move too fast to be considered possible by a real human. Despite its age, the graphics in Call of Duty are strong enough that you can still hate on the Wii graphics in peace. Point # 3: Story, what story? If I had to make a direct comparison of Call of Duty's story to any of the later Call of Duty games, the closest would be Modern Warfare 2. Both games suffer from a severe lack of a clear guided story. In the case of Call of Duty, I could piece the setting with what I knew about World War II history, but that alone doesn't make game compelling. The game includes a few reoccurring named characters which carry along from mission to mission, but most of the soldiers are generic clones. As an interesting design choice, pointing the crosshair at one of these friendly soldiers gives a name and rank, that's color represents health quantity. These names do not make me feel any closer to these characters who disappear or die as easily as I spotted them. In a real military company I would have a moment to ask fellow recruits where they were from, a hobby of theirs, or even just learn their nervous tick. These attributes are what made the movie Saving Private Ryan good, getting to know the characters. You won't find that in this game. As a demonstration of the failed storytelling, I will now give a SPOILER induced demonstration. After the rescue of Captain Price from a prison, rocking an even more British sounding voice than in later games, we join him on the raid of a German frigate. He is wounded and we are told to go on without him. Upon rallying back at our escape craft, the pilot shouts, "We lost the Captain?". Did the mantra "Show Don't Tell", mean anything to the developers? Captain Price was one of the few characters that received more than three missions worth of screen time, and he was offed as easily as a Star Trek redshirt. What were the particulars of his death? Did he go out guns blazing or succumb to his earlier wounds? This wasn't even a pivotal moment where he may not be truely dead but the player tells the pilot he is, then the player must weight the chosen sacrifice the rest of the game. Without a chance to cash in on the emotional investments, I just stopped caring about what happened on any of the missions. 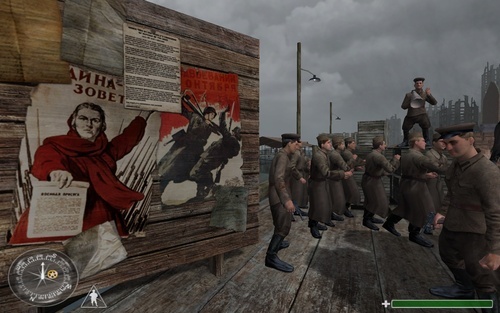 Instead of the game's narrative being fed to the player, the "story" are just the general themes about war based on the perspectives given rather than some overarching plotline. 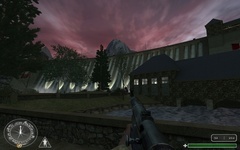 Building on the poorly constructed story, also just like Modern Warfare 2, the developers chose scenarios that would appear as epic as possible without always constructing the scenario logically to it. One mission might be on a dam, another on a boat, one in a tank, another raiding a prison. These missions are varied but what holds them together is a short pre-mission text. 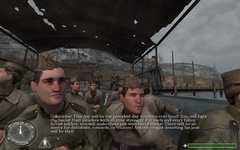 Since the player has to read, yes reading in a Call of Duty game, there is a slowdown of the pacing. Unacceptable! Furthermore, I hardly ever had to look at the objectives list the levels were so linear. I would usually just stumble forward, following allies, until I came to something to blow up or orders were yelled at me. Each level was the same, keep moving forward. The Russian campaign did this better, since the Russians had a known destination they were fighting to, Berlin. The Russian push was also the most dramatic with the scale of the explosions and quantity of allies around the player, but even then, I didn't feel invested. 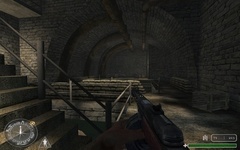 For the American and British campaign, there was little connection between most of the levels except the end of one level might begin the next segment. Even then, those level segment connections only barely explained more than three missions worth of why anything was happening. Even the final American mission did nothing to tie up any apparent story better than any of the ones before. Blow up a V2? Sure why not. Yay, the war is over! Breaching a building with comrades beside the player is a thrilling experience and any of the levels where the AI supports the player creates a dynamic battlefield where Call of Duty shines. These allies point out targets and draw the enemy fire to give a chance to strategize and pick targets of interest. When the game is reduced back to a solo-navigating experience the game limps back to mundane standard shooter mechanics. The AI in general is good but with noticeable quirks. One of these quirks is how friendly soldiers will throw grenades with abandon, killing themselves and allies. Their attempts to get out of the way of grenades are also laughable, and nearly always fatal. When it comes to gunplay, the AI is much better. The AI will pop out from behind boxes and corners to take fire. If the player tries to fire on an enemy soldier and misses, the soldier will realistically take cover. 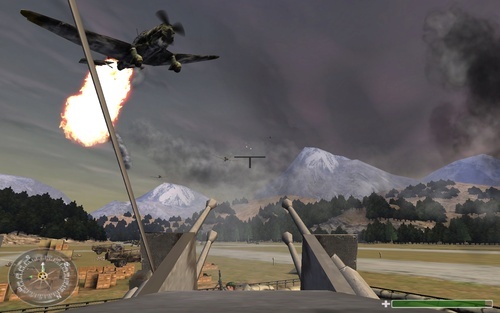 This suppression tactic is especially important on some of the later missions indoors, where spraying bullets allows the player and allies to advance. Only one level in the single player acknowledges that suppression works, but it is programmed on all the levels, and is delightful to see being used in unscripted engagements. The AI is also knowledgeable enough to re-man empty machine gun emplacements. For the enemy this isn't so good, since I knowingly waited till they re-maned and then sniped them off as easily as the first guy. 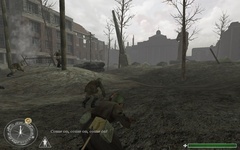 However, focusing on other targets and then being fired upon by a previously cleared emplacement keeps the player on their toes to a changing combat zone. I've already gone through some of the faults of the AI in the cheapness point, so I won't go into detail again about it. Just be reminded that the AI appears out of nothingness to strike the player down, are placed in every hallway to much fatigue, and have insane accuracy. Most of the gameplay can probably be garnered from what has been previously mentioned, though I wish to call out a special portion of the game that stood out. I'm referring to the Russian tank missions. In this only driving segment, the player commands a Russian T-34 as it kaputs Panzer IVs and mows infantry to their arrowless kneecaps. What made these moments so memorable was the destructibility permitted, drive over trees and they collapse. Shoot at infantry in a building and parts of the building blow off. Not since Battle Tanx had I been allowed such Tank devastation and that was a game especially emphasizing tanks. Comparing to other FPS, I likened the experience to Bad Company, which was still many years from existence. 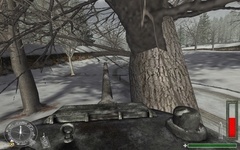 I was glad that when running into a tree the tank/vehicle didn't just stop like Battlefield 2 and other classic first person shooters. The pacing of Call of Duty's multiplayer is of Quake status and ferocity. There are no perks available, and no World at War style vehicles. Instead, all the soldiers choose from a common set of weapons and duke it out. The kill cam that has become a status quo in all the other Call of Duty games makes its appearance to good results. Since all the equipment comes standard, a couple mechanics make multiplayer interesting. Firstly, there are no claymores as Modern Warfare fans would be aware of, but grenades can be rigged as booby-traps. By sacrificing the ability to throw them, grenades can be attached to the ground, or the wall protecting the flank. Another feature allows bodies to be searched to find replacement equipment, but players don't know what will be found until the search is complete. 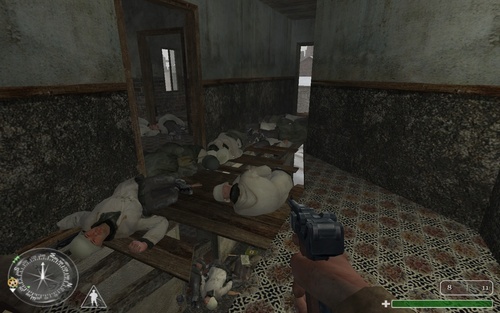 Scavenging these bodies is generally a waste of time since fallen weapons can be found in great supply on the ground. Lastly, and this took me by surprise, you can shoot people's heads off. The first time I saw it I was shocked, wait…is that a head? Yes, it is Jimmy, that is a man's head. People's heads will pop off if you get a head shot. Considering this effect doesn't even appear in the single player, I found it to be a very unusual choice. It is a bit cartoony to see the heads come off so cleanly, but I appreciate that the developers did not shy away from including due to possible rating. I don't recall any of the other Call of Duties including this cosmetic feature. Why wasn't it in single-player though? In its classic status Call of Duty should be looked at much differently from modern cinematic shooters. Don't come looking for a well-told story with memorable characters. Instead, if you enjoyed the old arcade feel of gaming with room after room of enemies to slough through than this is the game for you. Just be sure to stick around your allies and keep them alive. Don't find yourself taking the enemies alone and you should have a good time.